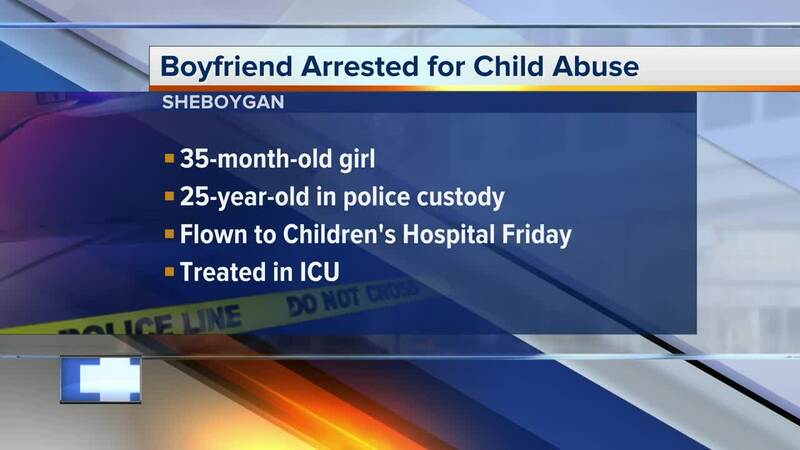 Sheboygan Police are investigating abuse of a 35-month-old girl treated for life-threatening injuries. A 25-year-old Sheboygan man has been charged for the physical abuse and neglect of a two-year-old girl treated being treated for "severe life-threatening injuries." Police say Jonathan Colon brought the unresponsive 35-month-old girl to Memorial Hospital where she was later transported to Children's Hospital of Wisconsin by Flight for Life. Colon was babysitting the child when he claims while the child was bathing he returned to find her nose in the water and her stomach "very big and hard," according to the criminal complaint. He said the child was barely breathing and proceeded to do CPR. The suspect claims that a bruise on the child's cheek, an injury to her wrist and a bite mark on the girl's shoulder were all from his own daughter not him disciplining the 35-month-old. Physicians at Children's Hospital of Wisconsin diagnosed the young girl with life-threatening injuries caused by a blunt force trauma to the abdomen area such as a kick, punch or stomp. Colon was taken into custody Friday.